We will use a color selector created by Brian Grinstead. It is found on Brian Grinstead's GitHub page. The editor widget itself is available at H5P's GitHub page. As you can see from the library definition above, we use the H5PEditor namespace for editor widgets. The files named spectrum.css and spectrum.js are part of the generic color picker. * Append the field to the wrapper. * Validate the current values. Other than that we define the constructor, which only store references to the input parameters. 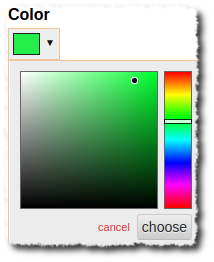 The setColor function is invoked from the appendTo function, whenever the color picker fires a change event. The important thing here is that we set colorSelector as the widget, which makes our widget being used instead of a standard input field. Thanks a lot for this tutorial and h5p. That's a really fun & powerfull tools. Is it possible to attach a corrected zip of the widget library ? (I don't know where exactly adding the "Create code for doing validation and saving" code).